Sometimes you have a table with a fill color in the top row to make it stand out. But how about if you decide you would like to have that exact same fill color in another row in your table to draw the reader’s eyes to it? How would you go about copying it? Your first thought might be to use the Format Painter but that only copies the text format and not the fill color. There is a way around this and it is fairly easy to do using the available tools within Word 2010. Select the row that has the color you would like to replicate. Click on the Design tab on your Ruler. 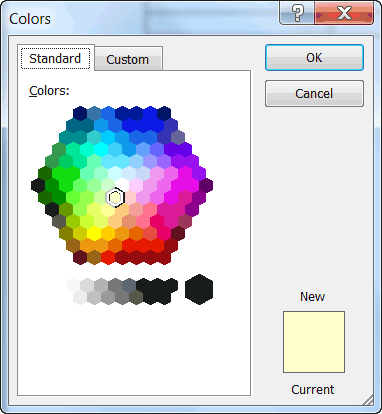 In the Styles group, click the down arrow to the right of the Shading tool which will display a palette of colors. Click on More Colors to display the dialog box and the color of the selected row should already show in the dialog box. Click OK. You do not have to do anything else, just click OK. Select the other rows in your table where you would like to replicate the first color. Click on the Shading tool on the Design tab of your Ribbon and the color is applied to the selected rows. Once you have done this, if you find that you would like to apply the same color elsewhere, just select the cells and click F4.